Centurion, I have completed my rounds. No sign of grave robbers. It is almost dawn. No doubt the presence of a Roman guard has scared off any trouble-makers. Mary, what is this all about. Have you been running? (out of breath) Yes I've been running. They've taken Jesus. I went to the tomb this morning with the others. They're right behind me. We went to finish the burial preparations. (heavy breath) When we got there the stone was rolled away. So we stepped in. But it was empty. (walking up) Peter, What's Mary doing here at this hour? 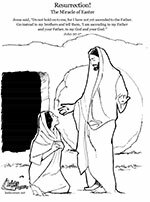 Mary says she went to the tomb, but Jesus was gone. John, the tomb was empty. Someone has taken the Lord. But who? There was a guard. What happened to them? I don't know. Maybe they moved Him. Father, have you heard. They say He is alive. I told them not to tease. The others knew I loved Jesus. Is it true…that He's alive? I knew you'd know. Slow down, little one. What's this all about? Sarah's parents know someone who just came from Jerusalem. They say that Jesus has been seen, and He's alive. (Shocked) Sarah's parents are very well respected. I haven't known them to spread rumors. But have you heard anything? No. Not like that. I hope it's true. Can we go to the feast early this year. That way we'll be able to find out. Maybe we can see Him! We were just in Jerusalem. You know we can't go again till the feast. But I can't wait till Pentecost. That's over a month from now. I'm sorry we just can't go till then. Can't you find out for me. You know more people in Jerusalem than Sarah's family. Can't you send a messenger? I'm sorry, but we'll just have to wait. I know you don't understand, but many of my friends in Jerusalem wouldn't like me asking questions about Jesus. I know. I hate waiting. But somehow I know it's true. I'm going to go and ask Hannah's maid. She knows everything. Maybe someone else in town has heard about this. (whispering) I wonder why the Lord wanted us all out on this mountain? (whispering) It's been forty days since he came back to life. Maybe now he will act and set up his Kingdom. He's rising into the clouds. (reverb) Why are you staring up at the sky? (reverb) Jesus will come back. The very same one who has gone to heaven will someday return. (reverb) The same way you have seen Him go. (reverb) Jesus will come back. Bible Source: Holy Bible, New International Reader's Version, A Bible for Kids, Zondervan Publishing House, 1999.